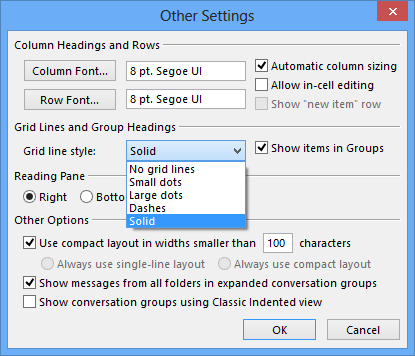 In Outlook 2013, a number of features have been changed as well as added. Along with that, the message list has also been modified a bit. 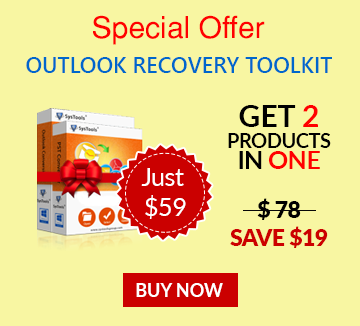 The changes which are reflected in Microsoft Outlook 2013 have been discussed below. The new look of Outlook 2013 is not perceptible by users because of some changes made to the user interface also, the entire look of Outlook is not appealing to the users. Now, the users can see 4-6 messages less in their message list than what was there in Outlook 2010. The changes were basically done to provide the users a clean interface. Another target of this feature was to ensure that it adapts with all the live tiles on a phone or tablet screen, well. Even though, white is the base color for all Office 2013 applications but most of the complaints of users are targeted towards the look of Outlook. The following instructions will guide the users to how to manage changes of new features of Outlook 2013 and provides users suitable ways to work with around them. Any unread message in the inbox of Outlook 2013 will be highlighted in blue colour.The envelope icon which was there in Outlook 2010 is no longer there. A user has the option to change the font type, colour, font size in order to categorize unread and read messages. Moreover, a user can also use the options to display the fonts and colors for specific emails received from particular person. The blue color of the subject matches with the color of Outlook 2013.However, if you don't like it and prefer it being rather black again then changes can be incorporated. The users can also change the color of the subject to any color other of their choice. To do it, user can follow the settings below. Click on the "View tab" which is at the top of Outlook. Then select "View Settings"
Then select "Conditional Formatting". Then click unread messages to make sure it is highlighted. There is a preview of what the font and color will look like. Click the option "Font". 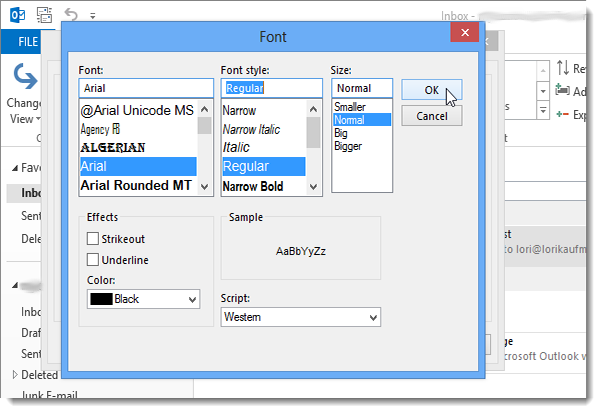 From the "Font window", you can choose the "font, font style, size, and color". Make any changes you desire and click on "OK" when you are finished. Select "OK" twice to confirm the changes. Any unread messages will be displayed with the new font and color you have selected. In your message list, Outlook will now use a larger font to display the sender's name and a smaller font to display the subject of the message. 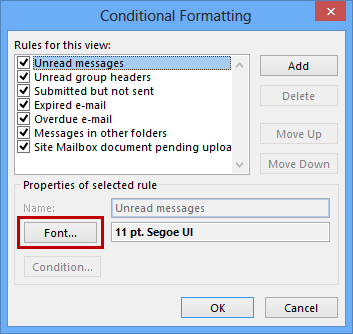 To decrease this font size and make it the same size as the subject, you can create an additional Conditional Formatting rule without setting any conditions but just setting the fonts to smaller. The procedure is carried out in the following manner. Select tab "View-> button View Settings-> button Conditional Formatting." Outlook 2013: Minimized Ribbon, custom view, Compact Navigation shows 13.5 items. Here, the Windows dpi configuration is set to 100% and Outlook is maximized. Bottom Line: Looks should not be deceptive because Office 2013's interface isn't appealing to a lot of users but it certainly fulfils the purpose of a large number of users in a very well organized manner. The interface has been designed according to Windows 8 style which works well in case of touch-enabled devices. The design has been incorporated to speed up the performance level. However, users who don't find the appearance of the User interface for Outlook 2013 acceptable can make changes suiting their requirements with the above mentioned guide.